In late 2011 my husband Mark was out in our garden one afternoon and saw an ET craft pass by over our house. He said it was metallic and hovered over silently, beneath the level of the clouds. We believe that we were possibly located in this way first. One week later I woke up suddenly sometime in the early hours of the morning, and then felt myself being pulled out of my body by another being. This is a sensation I am very familiar with, as I have experienced astral projection many times through practicing various techniques to have out-of-body experiences (OBEs) since around 2002 after learning those taught by my husband. However, this was different to the usual feeling of lifting up out of the body experienced in exercises of astral projection as I was not trying to astral project at all, but had been fast asleep and then felt myself being pulled out of my body totally unexpectedly. Techniques I have used for astral projection usually require a lot of steady concentration as well as relaxation. It is usually very difficult, as the mind is typically very scattered and so someone tends to just fall asleep, after a lot of trying, and goes into dreams. Instead in this case I was was rapidly taken out of my body within seconds, without any kind of warning. I felt a hand grasping me by the back of my neck; it maneuvered to find just the right grip as it held special cords which allowed it to separate my astral body from my physical one and then control the movements of my astral body. Once I was in the astral, I was held, suspended in mid air above my bed. A portal then opened up in the wall of my bedroom beside me. I was carried through it, feeling my stomach drop as everything beneath me fell away and I passed out into deep space. While this was happening I was completely clear and lucid – as if I was in physical reality. I was carried and directed like this through various scenes and locations which were explained to me by the being, as if a celestial tour guide, who I could not see at first, but who had a loving presence and female voice. Each thing I was shown revealed information about extraterrestrials, their connection to ancient human civilization, their view of our modern civilization, and the future of contact. I was able to talk to the being and ask questions as we went along. The extraterrestrial being said she had only limited time as she was extremely busy. At the end of the time she had, as if timed precisely, she returned me to my room. She then allowed me to look at her and see her clearly. She looked human, with fair straight hair and pale blue eyes, except her eyes were a more oval in shape and were spaced further apart. I thanked her, feeling a great sense of friendship towards her, and asked that she please visit me again, which she has since done in the same way. She said goodbye, and at that exact moment I felt her grasp loosen from my neck and myself merging again into my physical body. I then awoke in my room with a vivid recollection of what had just happened and an utter sense of awe. The day I went to first publish this experience I received an email with an experience from someone else who was also taken out of his body by a female being who carried him by the back of his neck and took him through space to see how an extraterrestrial civilization lived on another planet. Back in 2003 I had another similar experience in which I felt myself being pulled out of my body and then found myself before a group of around seven extraterrestrial beings who were short with dark oval eyes and had luminescent blue colored skin. They irradiated total love and peace, and communicated telepathically. Like many others, I have also had dreams with extraterrestrial beings. These encounters, along with others I have read, show absolutely that extraterrestrials, like us, are able to travel in other dimensions of existence and make contact. It is, however, often difficult to narrate the content of the experiences themselves, because the nature of the astral is symbolic and intuitive, meaning that what I saw was often shown in a way which I needed to interpret whilst other things were plainly stated. Still other things were just about me personally, which are not intended for sharing. So instead I would like to share what I understand of what I was shown in these experiences. Most people believe that being contacted by an extraterrestrial means being greeted by one that has landed on earth in a UFO, and this definitely has and can happen. However, we as human beings exist in other dimensions simultaneously, and can even access and travel consciously in these other dimensions at will. Although ignored and oppressed through history, the knowledge of out-of-body travel has existed and been used by people in many different cultures. Like us, extraterrestrial beings are also multi-dimensional, and so someone who knows how to travel in other dimensions can meet them there, whilst physically it appears as though nothing at all is taking place. Anyone can learn to have an out-of-body experience (also called astral projection), and there is potential for someone who has a higher level of consciousness to travel in even higher and higher dimensions, allowing them to perceive much more of other dimensional reality, and gain access to more advanced levels of knowledge and contact. Extraterrestrials are closer to us than we can imagine. Many people mistakenly believe that only advances in science, and the exploration of vast space, will allow us to discover them. However, as large numbers of documented witness cases reveal, they are right here with us already and all around us in vast numbers from possibly hundreds of different civilizations. Whilst these spacecraft are most often unseen in the physical world, whilst out of the body they can be seen as vast swarms in the sky. Human kind is in an incredible crisis; it is on the verge of complete chaos and destruction, and they are here in huge numbers working with extreme urgency in various ways to help. They are our greater cosmic family, like highly advanced brothers and sisters from throughout the universe, capable of knowing our thoughts, of seeing us without physically being present, of communicating with us in other dimensions which they can travel through without craft and beyond time. It appears that they contact those who will in some way help others, and apart from passing UFO sightings and deliberately leaving messages like crop circles, can be completely undetected by people normally, who therefore conclude that they simply don’t exist. Anyone is able to make contact with extraterrestrials through using out-of-body travel in other dimensions (which all beings share). However, I was told and have seen that they are extremely busy. My impression is that they interact with people who are in some way working for their cause, which is to help humanity, and at least in part to understand what extraterrestrials are and what they can teach us. 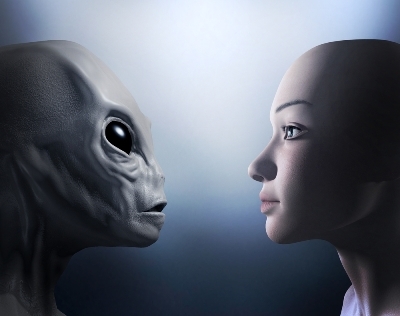 The extraterrestrial stated that they are gradually introducing themselves to humanity, and that at some point people will be able to talk to them face-to-face. To me, this gradual introduction is something they seem to be timing deliberately given the very ignorant and violent nature of our current civilization. It seems there will have to be certain circumstances before face-to-face contact is possible, given the testament from military personnel at some of the highest levels revealing that the military has attacked UFOs, been ordered to shoot them down, and in some cases has captured and murdered extraterrestrial beings. One of the tasks extraterrestrials have is to monitor the quality of our environment, such as the purity of the air and water, to make sure that earth remains able to support life. This just shows how poor the level of our civilization is. I visited one such spacecraft out of the body which had beings of different extraterrestrial origin working together on this task. Another craft I was on out of the body was occupied by a team who was monitoring Earth from space. The extraterrestrial being I met stated that people who have nuclear weapons are “Godless people.” I didn’t know much about extraterrestrials before these experiences but later watching the testimonies of the Disclosure Project, I was amazed to hear of the multiple accounts of UFOs powering down nuclear weapons, which they have done repeatedly in countries around the world. Extraterrestrials risk their lives traveling to our planet. I have been told that having physical contact with them at this point is highly unlikely given the extremely aggressive and violent nature of humans, and that we are seen as something akin to interplanetary terrorists. I was shown by the extraterrestrial that occasionally there are individuals in their own civilization that “devolve” (degenerate in other words), but they are dealt with without violence in any shape or form. Unlike our civilization where criminals and even completely innocent people (along with animals and the environment) are treated with violence, this extraterrestrial civilization is completely non-violent. I had also been told in another experience whilst visiting an extraterrestrial civilization in an out-of-body experience that they do not have a word for hatred in their language. I understood at the time that this was because there was no need for one. I am amazed to see that there are many people and entire organizations who have tried to make contact with extraterrestrials, with vast budgets and technology, that have failed to turn anything up, whilst people who are genuinely working to bring the knowledge of extraterrestrials to the public, or who will do, are contacted by extraterrestrials without even wishing for it. One example is Colin Andrews who founded the term “crop circle” and has done a remarkable work in researching and bringing to the public the messages of crop circles. He relates numerous encounters he’s had with UFOs because of his research, which even include answers to his prayers (again an example of their ability to perceive through dimensions non-physically) by creating the crop circle pattern that he imagined and asked for in a field that was the closest to where he lived. Colin has obviously been moved by this contact and urges people to understand love and consciousness, which is very much the message of extraterrestrials. Another example is Dr. Steven Greer who heads the Disclosure Project and organization CSETI, who has also done a remarkable and courageous work in bringing forth the eye-witness testimonies of hundreds of top government and military officials who have sighted or been involved with UFO projects, and exposing the massive world-wide cover up of these incidents. Dr. Greer has also been touched by the deeply spiritual nature of extraterrestrials. He writes that we are one universe with one people, and recognizes that understanding spirituality, consciousness, and other dimensionality is necessary when attempting to understand extraterrestrials. Myself on the far left and Dr Steven Greer on the far right. I have experienced trying to make physical contact with ETs personally with Dr. Steven Greer in which a number of different craft were both sighted and caught on infra-red camera (this camera enabled the otherwise mostly invisible craft to be detected as they were moving in a light range imperceptible to the naked eye). Comparing both the physical attempt at contact, and the contact made whilst out of the body, the astral contact not only allowed for a deeper, more communicative, and spiritual contact, but it also demanded it. In my experience, there appears to be a certain level of behavior required to communicate through conscious out-of-body experiences with extraterrestrials, which includes not being reactive or aggressive in any way. A number of times during the experience I had with the female extraterrestrial being I felt an emotion of fear, excitement, or disappointment; each state affected the experience, obstructing what I was able to perceive and how she was able to share things with me. In some cases experiences and scenes were cut short because of these ego states. It made me realize even more how much these states impede us from communicating with these beings and from accessing spiritual knowledge. The extraterrestrial being which made contact revealed that they personally had achieved a highly advanced stage, if not having completed, the spiritual process that leads to enlightenment. While some people suspect that enlightenment is a common thread that runs throughout many of the world’s great sacred teachings, most have probably never stopped to think that it is a common thread that runs throughout the entirety of creation. The being was well aware of the “work” as they called it, and knew that this “work” is something people studying Belsebuub’s works are attempting. Whilst traveling with the extraterrestrial I also heard music, which was implied to be of non-earthly origin. It was harmonious and sounded like it was made with electronic instruments. The closest thing I have heard to it here are some types of “New Age” modern music. Again, to me this reflected their harmonious inner states – in contrast to much of the discordant and heavy music so popular in our culture. I find it deeply concerning to hear in military and government testimonies from the Disclosure Project that there is the possibility of a staged “alien attack”, and that recovered UFO technology is being used by “black projects” to carry out fake sightings, mutilations, and abductions to convince the public that extraterrestrials are hostile leading up to a staged attack. Dr. Steven Greer of the Disclosure Project writes about this here. I can state that from my encounters, extraterrestrials are beings of real love and care who are working bravely and tirelessly to help us, especially now in this hour of immense earthly change and upheaval. It is so disappointing that confusion, misinformation, and fakes are sown amongst genuine evidence of extraterrestrial contact in order to throw the public off into doubt and disbelief, and worst of all, to create widespread public aggression and fear toward our extraterrestrial family. I personally believe that the next step in making contact is through practicing the same cosmic principles and spirituality that we share with other beings throughout the universe, and using it to achieve a higher state of consciousness to enable us not just to be contacted by extraterrestrials, but to work with them, and to use out-of-body travel in other dimensions to converse with them about higher realities, the future of our world, and even our own personal spiritual growth. 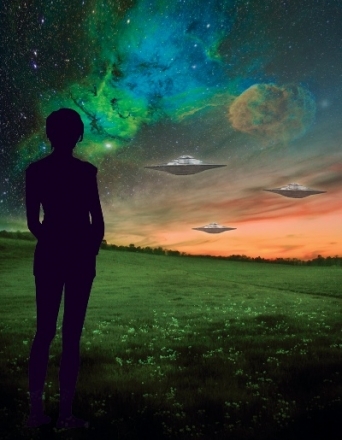 Extraterrestrials are not the enemy—they are our dear friends. We are all part of this eternal and infinite cosmos of wonders together; extraterrestrials that travel here are at a higher level of spiritual development, and have a far greater knowledge of the process of enlightenment, and the principles that govern creation, than we do as a whole. They therefore have much to teach us, but I believe, the greatest value that can be gained through contact is to communicate through the shared experience of these principles and processes, and to work together in their fulfillment. Ancient hieroglyphs looking very much like advanced craft, carved into the temple of Seti I at Abydos in Egypt. I believe that they can only communicate with us according to our level of consciousness, and at this stage much of their contact is at a very basic level – appearing in craft, partially materializing to people, powering down weapons, and helping Earth to sustain life – yet the potential of contact is vast, as some of them are incredibly spiritual beings. They have distanced themselves from us, but they once had contact with at least the ancient Egyptian culture of the past. We have let our egos and inner states shut us off from experiencing the things that higher levels of spiritual advancement have to offer, which extraterrestrials clearly benefit from and we as a civilization do not. By learning about cosmic principles and working in harmony with them, we too could advance and gain access to all that this way of being allows. Human beings contain the same possibilities for achieving these higher levels of spiritual development. Although as a civilization there is not the collective will to work towards this, individuals still can. I urge anyone who is interested to learn how to travel consciously in other dimensions, to take up the universal process of enlightenment, and to work in divine harmony alongside our greater cosmic extraterrestrial family for the betterment of creation. In agreement about everything except i am not totally behind all Greer says. His work in invaluable but he claims that people who claim to be ET experiencers and who have visited “the cosmic doctor” as we call it, or wake with scoop marks, are MILAB victims, fantasists, drug adddicts , wannabes, or mentally ill. Which is very damaging. It is a claim he has made many times. I am a former therapist for a known ET experiencer support organisation. Cheers Melanie. Yes, it’s also been my experience that extraterrestrials are very loving and are trying to help us. They are the opposite of what is portrayed in most Hollywood movies, which in my view are propaganda aimed at turning people away from them. I don’t know of any groups you could speak with, but feel free to share experiences here, and discuss. What an extraordinary and wonderful experience Lara. While the mainstream media and Hollywood try to frighten us about Aliens, it seems that there are very many accounts of people who have met with extraterrestrials in some way and describe them as highly intelligent, spiritual and benevolent beings. In fact, we are extremely privileged to have these beings keeping an eye on us so we don’t destroy our planet and affect the universe in the process. They must be very concerned about our space exploits and plans to mine asteroids and investigate Mars, etc. I have also watched some of Dr Stephen Greer’s documentaries on extra terrestrials. Many of the people he interviews are highly credible and eminent individuals in their field. 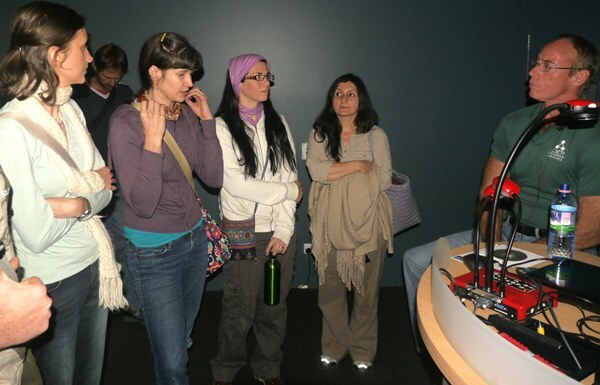 They claim that as a result of visitations we have access to extraordinary technologies. Unfortunately, many of these have been suppressed or utilised in ways that do not benefit us as they should. Thanks for this great article Lara. It is certainly inspiring and something to work towards. Dr Greer is truly courageous person. having read one of his books and listened to a few interviews his personal sacrifice has been enormous His experiences have been incredible. Im sure we have not heard the last of it. congratulations that you made the grade to have such knowledge given as a true gift . Im so glad that we are not alone in this desperate race against time. That’s so interesting about the ancient myth of Earth being used as some sort of cosmic high-security prison Lara! Could you mention the source of that myth? Also, do you have any recommendations for books in addition to the Kolbrin about this ET – human interbreeding, or even reliable accounts of ETs that might have visited Earth? I can feel there’s an inflated amount of skepticism in myself when it comes to reading the work of people who are supposedly from other planets, not that I don’t think it’s possible, and it’s surely in part a layer of cultural conditioning, but I’ve just not yet felt drawn to any I’ve come across. I’m sure you’ve come across the idea that the Rh negative blood type has an extraterrestrial origin! And thanks Anders for sharing your experience, it sounds like you have been gifted a very personal contact with some ET friends. I hope that what seems like their encouragement continues for you! It’s a good question about this inter-stellar probing of Mars our NASA is up to. I’m pretty thoroughly skeptical about it being anything good, if it’s even real! Are the elongated skulls of Peru, Aliens or just ancient people of earth? If they are ancient people of Earth , than their bloodlines maybe a different species (more evolved? ) than modern humans? Karen Hughes mentioned these Homo Caprensis as the true rullers of the world, I wonder , it would make sence. So in these Alien worlds are they affected by Demons & negative energies? Are there Demon Alien souls, Anne Rice’s new book deals with this concept? All this is so fascinating honestly. I personally suspect that the people with naturally elongated skulls have genetic input that is not of this earth, but I can’t say for sure. Strangely, I have found no ancient text that refers to people with elongated skulls, and to confirm it scientifically we’d need to have genetics from extraterrestrials to see whether any unknown haplogroups found in the genetic results of the elongated skull peoples match those of people on other planets. However, there are references, in what I think is a truly remarkable text called the Kolbrin, to a race of peoples who were seeded here from off earth in the distant past. These people were said to have eventually intermingled with other races on earth so as to have essentially disappeared. I can only speculate what life might be like on other planets. My feeling is that we are all part of the same universe and creation, and so the same principles ultimately affect us all – including the existence of darkness and negativity. Our planet is especially affected though. There is a legend that gives the reason for this – that a number of powerful ancient demons were imprisoned within the abyss of planet earth a long time ago, to spare other worlds. Strangely enough, I remember watching a near-death experience in which a man saw that our planet was a particularly dark place in the cosmos. As a result, the stakes are high here on earth, but the opportunity for learning and for heroic deeds is equally great. Thanks for your comments Lara and Ronson for asking questions that have also crossed my mind. Lara your comment about a legend that describes why we here on this planet are particularly affected by darkness had me wondering whether the ancient Greek myth about the Titan Enceladus who fought against the Olympian gods in an epic battle to control the cosmos may possibly have something to do with it? In this particular legend, Athena during the battle had hurled the island of Sicily on top of him to imprison him and each time he tries to move, it is said that it would cause Mt. Etna to rumble violently and spew fire and bolts of lightning into the sky (which unfortunately is currently making headlines today). Could you provide more info about the legend you are referring to? I recall reading that we were considered the rogues of this solar system by other highly intelligent extraterrestrials which unfortunately says alot about who we are collectively and where our level of consciousness is at. That’s interesting about the legends of imprisoned demons influencing the state of our planet. It reminded me of J.R.R. Tolkiens’ Balrog, demon of the ancient world, who in the Lord of the Rings film, appeared to be in chains, and who Gandalf eventually overcame. As well as perhaps a more credible source from the ancient Greek mythologies, that of the Titans who after a great battle, were imprisoned by Zeus in the underworld. Your last sentence is very much is worth remembering. This is a very very interesting article and makes me wonder what they think of earthling’s attempts to reach Mars. Just a week ago or so NASA landed a small spacecraft on Mars (InSight Lander) with the aim to dig a hole in the ground and measure and analyse as much as possible. A mechanical device like this may not be such a threat to anyone but as soon as we start to send people things may change because we are toxic beings outside our own planet. I guess the future will be very interesting now when Elon Musk and SpaceX also want to explore space. And since this article is about extraterrestrials I can mention that I had an experience once, perhaps 6-10 years ago. It was an extraterrestrial lady that whispered something in my ear, she did this in a special way that I didn´t understood at the time but I do now. I will not mention exactly what it was because it was personal to me but her whisper made me awake and then the experience continued in the physical world. I will just leave this as a cliff-hanger for now because the experience may have been personal, it´s better to be on the safe side. Something that I can mention is that they have said things to me on several occasions. They usually say just one word. The word has multiple meanings for me and is often made up of more than one word. They simply don´t waste energy and seems to be strict and exact but not in a brutal way that we act here on earth but in a loving way.